In the past, you would have had to know the registers used by the controller to setup the display, position the cursor or even write a single character. There was also timing issues to take into consideration. This is no more, with thanks to WiringPi. The code below is a very simple example of displaying some text on the top line of the LCD. 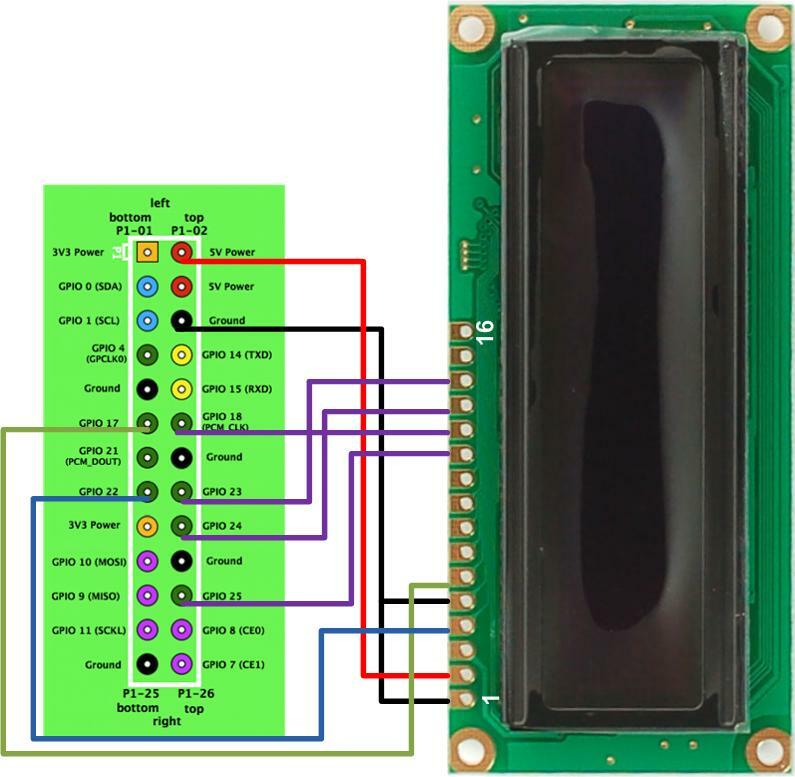 There is a complete list of all the functions in the LCD library on the WiringPi website. Lines 1 and 2 are required as these are the headers for the WiringPi LCD library. Lines 7 to 12 are the definitions for the pins used to connect the LCD to the Raspberry Pi. Pin numbers can be found here. bits = Number of bits or data pins used. Either 8 or 4.
d0-d7 = 8 or 4 bit mode. In for 4 bit mode, only specificity pins from d0 to d3. If using 8 bit mode, you need to specify pins from d0 to d7. In the example code above, we are using 4 bit mode. The LCD->Pi wiring diagram has an error, the sire from the LCD RS line (4) is going to the Pi connector pin 17 (3.3 v power), it should be going to ping 15 (GPIO3). I have updated the diagram. Hey, can you provide link to each library you have used? can it possible to replace a particular character on 16*2 lcd,if yes , please give me the code in c.on my er.saurabh2890@gmsil.com email id. Hello, my display for the first code does not show anything, and the second code show gibberish.. Can u please contact me and help me ? It woul be awesome ! Thank you, Tlásky. any one can mail me code for servo motor........ I'm facing some sort of problems.